When I was a boy, I imagined that one day I might become so skilled as a writer that I would silence all the critics. I was very young, and, of course naive. But I can’t help remembering that dream now that I am a writer and have made some permanent enemies as a result of my modest success. Even now, I’m close enough to the dreaming boy whom I once was that the word “enemy” sounds melodramatic, even paranoid. Yet what other word can I apply to people who imagine that I am always writing about them, and who spend an inordinate amount of time not only bad-mouthing me, but writing abusive posts and emails to repudiate my opinions? “Critic” or “detractor” might do, but neither word suggests the fury or the personal rancor of these people. So I suppose “enemy” will have to do. Still, no matter what word I use, the idea of having enemies bemuses me. I seem to be such a poor hater that I have trouble imagining dislike in others. And, to be honest, when I first became aware of the fact, I was taken by surprise. Until about a year ago, I had had a gentle reception as a journalist. Very little of the attacks that other free software journalists have endured had come my way, and never from steady, identifiable sources. So I hardly knew how to react to the situation. However, over the last six months, I’ve developed a habit of ignoring them. I won’t mention them by name in public, nor respond to their comments. In fact, I very rarely read anything they write, regardless of whether it’s about me or not; with all the intelligent and informative material about free software on the web, why should I waste my time? Most of what I hear about them comes in passing second hand references, or from reading a link on a portal site. Yet, almost despite myself, I can’t help learning a little about my enemies. For example, I can’t help noticing that none of them seem to be contributors to any free software projects. Moreover, the other people whom they attack (my enemies being very far from discriminating) are among the leaders of the community, and hard workers as well, even if I often don’t share their opinions or think their energies misplaced. So, while I would rather not be among those my enemies focus upon, I suppose their attention is a wry compliment to my articles. After all, if I was completely unsuccessful in expressing myself or providing unusual or thoughtful arguments, then they probably wouldn’t bother with me. But, even more importantly, when I do come across the writing of my enemies – regardless of whether it’s about me or some other straw man of the day – I’m starting to find that they help define me in a negative way. Just as, in the 1970s being on Richard Nixon’s enemy list was a sign that you were an effective social activist, so being a target of these kinds of people helps me to define the sort of person and writer that I want to be – in essence, everything that is the opposite of them. For starters, I have no wish for prolonged flame wars. I might toss off an angry reply, or even a second one, but, after that, I can’t sustain the emotion. There are so many more interesting ways to spend my time that I quickly lose interest. For another, while most of my writing about free software is advocacy journalism in the sense that, by choosing my specialty, I am implying that the subject is worthy of attention, I have no interest in attack journalism (I suppose that comes from getting enough sleep and not being wired on coffee all the time). I can disagree with a person or a corporate policy very well without any need to denounce explicitly. In the end, I would much rather stand for something than against something. Anyway, if I present the facts accurately enough, I don’t need to condemn – if someone or something is unpleasant, the fact will come through without me belaboring the point. Even more importantly, while I wince at typos and factual errors, taking them as proof of my own carelessness, I am far more concerned about logical errors. I don’t believe that, just because you find a tenuous connection to Microsoft that you have proved a conspiracy, or that simply because one event follows another that the first caused the second. I try very hard to keep an open mind as I research a story, which is why I usually can’t say the perspective I am taking until shortly before I start to write. I believe that quotes and other evidence needs to be taken in context, not jammed anywhichway into my existing beliefs as if I were some remote descendant of Procrustes. You don’t arrive at the truth by over-simplification or jumping to conclusions; you get there by acknowledging as much of the complexity as you possibly can. But perhaps the biggest difference between my enemies and me is that I don’t think that my writing is all about me. When I sit down to write, my goal is cover the topic thoroughly, and support any opinions I state so that they are plausible to a fair-minded person. However, I rarely write to justify myself when I’m reporting on free software, nor do I expect everyone to agree with me. In fact, those who disagree with me often force me into a more nuanced and therefore more accurate view of the subject. In the end, my goal is to send off a finished article with what Balzac called “clean hands and composure” — by which I mean the knowledge that, given my material and time restraints, I have done the best job of expressing my point that I could. Sometimes, I wish my enemies would find another target and leave me alone. Increasingly, though, I find myself accepting the fact that they are not going away in a hurry, even thinking that they are useful to me. For all the annoyance they provoke, they are examples of the sort of person and writer that I do not wish to be. So long as I act in the exact opposite way that they do, I can continue to be a person with whom I can live. A banner, I’ve found, is hard to hang by itself. Several weeks after buying the Bill Reid raven banner that is one of my daily delights, I limped back to the Bill Reid Gallery to buy the wolf banner in the same series. Since an injury had delayed me picking it up, I had been tormenting myself with visions of collectors discovering the banners and snapping them up, but, happily my fears were unrealized. Had I wall enough and cash, I could also have bought the frog, Mouse Woman, Dogfish Woman, and Beaver banners that were my alternate choices. However, I am pleased to have the wolf banner, because it is one of the most playful in the set of 13 banners. 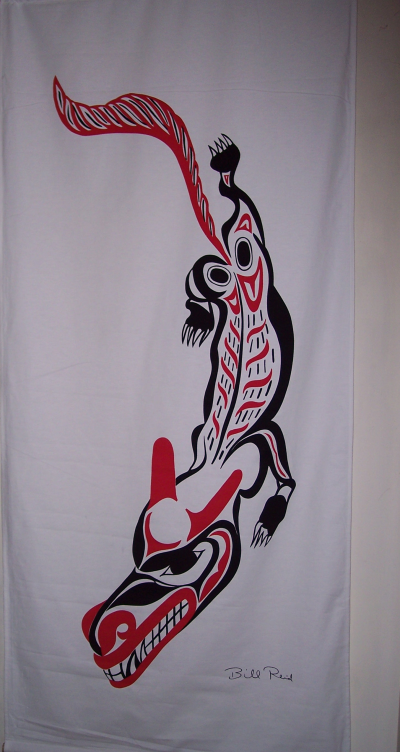 As Reid himself points out in the text of All the Gallant Beasts and Monsters, the book from which the banner designs were taken, wolves must have been a fantasy figure in traditional Haida culture, since they are not found on the islands. He suggests they must have been semi-mythical, the epitome of ferocity and hunger, with their teeth always sunk in somebody’s belly. It is this fantasy figure that Reid presents on the banner. The wolf’s twisted posture and the arrangement of the feet suggest that it stalking low to the ground. The head, which is as large as the body is dominated by the teeth, which are three-quarters the length of the head, with outsized nostrils and ears giving it a look of ferocity, especially with all these elements being red. The waving tail, also as large as the body, also helps to suggest intent, furious motion. The most traditional element in the banner is the head, and even there, the design elements are designed to suggest a roundness of form – a kind of nod to realism. By contrast, only the back hip-joints in the body are classically designed. The length of the body, the feet are almost sketch-like in comparison, consisting of red ribs and black fur. 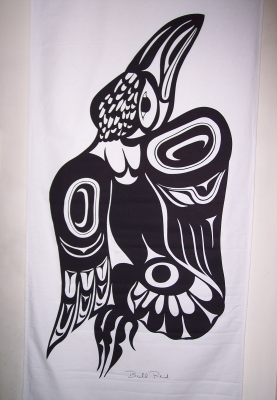 As with the raven banner, in which the body is almost neglected in comparison to the body and the wings, in this banner Reid is focusing on the key aspects of the figure. Even the claws are not emphasized in any way, perhaps because it is the wolf’s hunger that he is most interested in. All Northwest coast art has the habit of distorting figures to the surface, whether that surface is a ring, a box, or a spindle. Designing for the printed page or banner, Reid has no need to warp the design, but he does so anyway. His wolf twists asymmetrically, leaving much of the left side of the space blank – a suggestion, perhaps, that the wolf is stalking and trying to make itself less visible. One rear foot is stretched out behind suggesting that the wolf is moving low to the ground. At the front, though, the figure is so twisted that one foot is unseen, hidden by the head. Overall, the contortion of the wolf suggests a cat more than any canine – a reminder that this is a fantasy, but one whose blurring of natural categories adds to the menace. Unlike the raven, the wolf banner has little sign of naturalism. With its modernly asymmetrical posture and the use of red to emphasize the wolvish elements, this is an animal that has been designed rather than observed. You sense right away that this wolf is the sort you have nightmares about. It’s a second cousin to the one in “Peter and the Wolf” and Tolkien’s wargs, the kind you imagine chasing sleds across the frozen Russian steppes in the hopes of snapping up a passenger. At the same time, the depiction is so exaggerated that there is a kind of black humor to this wolf. From both the design and his remarks, I suspect Reid enjoyed both the menace and the humor. The result is an ambiguous design that is both these things at once. I don’t come from a musical family. One of my parents admits to being stone deaf, and the other never developed much musical taste beyond the musicals and popular songs of the Fifties and their latter day equivalents. As a result, most of what I know about music I’ve learned through trial and error on my own. And, as might be expected in a writer, my tastes show a strong preference for music that includes poetic and intelligent lyrics. I certainly never learned much about music at school. In elementary school, the teacher was a semi-professional musician whom those with musical training adored. Unfortunately for me, he had no interest in teaching those of us who didn’t already have a musical background. Given a trombone to play because that was what my brother had used, I was put into the band class with no understanding of what I was supposed to do, and no one who was interested in showing me. Predictably, I suffered as only a proud child can suffer. Bad enough that a solo passage for trombone in “More” was given to a friend who played the French horn because I was incapable of it, but, by the end of my penal servitude in band the teacher wouldn’t even bother to see if I was in tune. That I was good academically and athletically, and that these humiliations were very public, with an audience that included several girls on whom I had crushes only made the experience harder to endure. But I’ve always been a whistler and a singer, and somehow I started discovering some musical tastes on my own. I started with Simon and Garfunkel, attracted by Paul Simon’s songwriting, and soon branched out into Bob Dylan, whose cryptic lyrics made my tastes an oddity in my neighborhood and generation. Stumbling blindly and still not really knowing what a flat or a sharp was (since no one had ever bothered to show me), I kept on in the same vein, discovering singers like Roy Bailey, Leon Rosselson, Maddy Prior, Stan Rogers, and June Tabor, all of whom were either song-writers themselves or at least selected intelligent material. I didn’t completely neglect acoustic music, but the music that I’ve kept coming back to all my life has generally had strong lyrics. Needless to say, it was definitely not Top 40. But Vancouver is full of small concert venues for those who have come to listen rather than mingle, and, at times, the greater part of my social life has been going out to concerts. Neither was my taste classical. To this day, my knowledge of classical music is made up mostly of enthusiasms. I know enough that I can tell Chopin from Beethoven or Mozart, but my favorites are a haphazard lot: Vivaldi, a lot of romantics or eccentrics like Sibelius or Grieg, some Wagner overtures, and even Scriabin, whose complexities are intriguing even to my erratically trained ear. My blue and jazz knowledge ditto, although it’s been broadening recently. As for opera – well, English isn’t the language of operas, is it? If there are words, I am half-maddened by not being able to understand them. And a little light opera like Gilbert and Sullivan goes a long way, rather like reading too many P.G. Wodehouses in succession; you start longing for something of substance. Still, I’m not complaining – much. Considering my unpromising musical education, I’m surprised that I have any musical interest at all. The best use I found for my trombone was using its case as a sled after school, and, unsurprisingly, I used the transfer to high school as an excuse to drop band. Mostly, I don’t think about my musical mis-education. But, when I do, I start to get angry, not just at remembered humiliation, but at how unnecessary my lack of musical direction was, and how easily it could have been corrected by a competent teacher. I know I have a reasonable if limited singing voice, because I’ve used it at parties with no one fleeing. Yet when I think how close I came to eliminating music altogether from my life, I’m still full of resentments. Since I bought the Bill Reid banner last week, I’ve been thinking a lot about living with art. I pass the banner several dozen times a day, and, at just under two by one meters with a powerful design, it constantly catches the eye. My first conclusion about living with art is that it’s not a possessive thing – at least, not for me. I don’t gleefully exclaim to myself “Mine!” when I see it, or even the more proper, “Ours!” Nor do I think that I’ve made a good investment, or how much the banner might increase in value over the years, because I have absolutely no intention of selling it. So far as I can tell, I would get the same pleasure if I was undertaking an extended stay in a hotel room that included the banner, or if it was simply on loan. It’s being around a work of art that is important to me, not who owns it. My chief reaction is a feeling of being privileged to see the banner every day. Having my aesthetic appreciation stirred several times a day is an intense feeling. It relaxes me and leaves me content in a way that very few other things do. Great art (by which I mean art that is skillfully done and more than just giving people what they think they want, not simply art made by someone that consensus classifies as a great artist) has a purity of intent that contrasts strongly with the everyday world. Like learning, it’s above the petty corruptions and compromises that we usually just accept without questioning. It has a sustaining quality that arbitrary, constant-changing fashion can never have. Its excellence is the best of us, and I am quickly becoming convinced that we are better for living with such art. Or, at least, I am. Another benefit of living with art is that you get a chance to see how an artist works. When you see art in a gallery or in a book, you rarely have time to pinpoint why you react the way you do. But when you see a piece every day, you start to appreciate it in much greater detail. For instance, after a week of living with the banner, I now understand that Reid was a meticulous planner, and that his designs not only frequently have a geometric pattern in them (such as triangles whose corners consist of similar shapes or a certain number of objects such as feathers), but also are constantly playing symmetry against asymmetry – a contrast that seems utterly fitting for an artist who is at once working in a tradition and with modern concepts of design. For years, I’ve been spell-bound by Bill Reid’s work, but until now I never noticed these characteristics of his work. Of course, I don’t claim that one piece teaches me everything about his work, or that I have discovered everything about this particular work – especially not in seven days. But I know more about his work than I did, and now I understand more about his style and his design sense, as well as that of other artists in the same tradition. By living with the piece, I know a little more than I have previously done, and I look forward to learning more. Living with art, I’ve decided, is one of the great civilized pleasures of the world, like an unexpectedly fine beer or wine or discovering a superb restaurant. It’s also a pleasure that I’ve mostly overlooked for a number of years and that I plan to pursue from now on as much as a limited budget allows. Today, I was interviewing someone who stated that any company or free software needed a leader who was passionate about the work. The idea was that, being a leader, they could quickly make the decisions necessary for the smooth running of the company, and that, being passionate about the work, they would make desirable decisions – or, at the very least, spare their subordinates the problem of making no decision at all, which the interviewee saw as often worse than making a wrong decision. Given what I know of the interviewee, I wasn’t surprised to hear this belief expressed. All the same, I was amused that, shortly before the interview, I had read a new release announcing that a former employer, who also believed in being a passionate leader (perhaps he reads the same books on management as the interviewee) had just sold 95% of his company after five years of trying to make it consistently profitable. And if that is not a sign of bad leadership, what is? As the interviewee expounded his theory, I couldn’t help thinking that you can passionately make the wrong decision at least as often as the right one. If anything, if you push logic aside in favor of inspiration, you’re probably more inclined to make wrong decisions. Also, although I kept silent – interviews not being about me, I strongly believe – I couldn’t help thinking that, nine times out of ten, when people talk about leadership, they are viewing themselves as the leaders in question. What other people might think of the arrangement they are expounding hardly enters into their consideration. The assumption always seems to be that non-leaders will automatically follow. I suppose that some people might exist who want a leader to make decisions for them. Or, at least, if they do exist, such people might explain neo-conservatism. But, I’ve never met them. The most apathetic and most obedient alike always seem jaded or cynical about their situation, if you can get them talking in a place where they feel safe. For the most part, I suspect that people are not looking for a leader so much as a sense that their input into a decision matters. Nothing can be more irritating to someone with specialized knowledge than to find that their experience has been ignored in the decision-making. I remember one long, hot summer when I was working on a design and writing project with a company. Whenever we held meetings, the CEO would arrive forty minutes late. He would then spend the next twenty minutes vetoing all the decisions the rest of us had made before his arrival – so far as I can see, simply because he felt like asserting his authority. Those of us who were consultants soon got into the habit of being late ourselves, and of not talking about anything to do with the project until the CEO arrived. Needless to say, we were fuming, partly about the waste of time, but partly because our suggestions, which we believed were in the best interest of the company, were being ignored. Very likely, we were sometimes wrong n our decisions, but, given our experience, we were almost certainly right more often than the CEO, who had no relevant expertise in the project – only a passion to have things his own way. Such experiences explain why, whenever someone talks about visionary leadership, I start getting very apprehensive (at least when I have to endure it; when I don’t, I just shake my head). Somehow, business in the twenty-first century has got hold of the idea that leadership is some sort of natural trait or at least something that is an end in itself. The idea reminds me of people who believe that a writer simply needs to know how to write, and has no need for expertise on their subject – in both cases, the odds of poor performance increase to near certainty, probably because so much time is spent disguising ignorance and inability. Personally, I think leadership is simpler than that. These days, I tend to avoid situations where leadership arise, having decided that I have no particular wish to lead, and that I most definitely do not want to led. However, in the past, leadership roles continually came my way – probably due the wrong-headed belief that if you are skilled in one area, you are somehow fit to lead. When I could not avoid such roles, however, I quickly learned that they were not about me, or making me feel good. To me, leadership decisions were simply a matter of problem solving: I gathered what information I could in the time allotted, consulting people when I needed to, made a decision, then moved on to the next matter needing my attention. But, then, I’ve never thought that any leadership that wasn’t hands-on was worth a damn, anyway. To this day, I have no idea how effective a leader I was. Nor am I likely to find out now. But it seems to me that there is far less to the role than those who aspire to it like to pretend. Passion? Vision? So far as I am concerned, passion is for martyrs, and visions are for saints. I’ve always been aware that I wasn’t so exalted, and that I had a job to do. 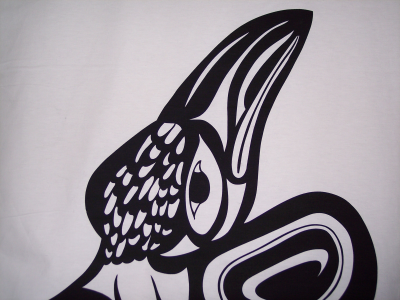 For many people, Bill Reid is the epitome of Northwest Coast art. The reputation is both deserved, given the quality and variety of his work and unfair, given the number of artists in the same tradition who are equally worthy of acclaim. But regardless of how you view his reputation, Reid has a strong claim to being the major Canadian artist of the late twentieth century, with one of his pieces both on display at the Canadian embassy in Washington, D. C. and on the back of the Canadian twenty dollar bill. And, like any admirer of Northwest art, for a long time, I’ve lusted to have one of his works but been unable to afford one – until now. Even then, I only did so by getting into an area that the collectors haven’t discovered yet. I bought a canvas raven banner whose design is an expansion of the illustrations that Reid did for All the Gallant Beasts and Monsters, which was published in 1991. The banner was part of one of two complete sets of banners from the personal collection of Martine Reid, his widow, and was sold through the recently-opened Bill Reid Gallery in downtown Vancouver, so its provenance is unquestionable. In fact, I’ve left my email address with the gallery so that Martine Reid can give me more details about the banner. The last stages of Reid’s development as an artist could be called his post-Haida era, in which Reid, while obviously basing his work on tradition, began incorporating more modern or personal elements into his work. The banner fits very clearly into this period. While the ovoids and wings feathers are in the Northwest tradition, the torso, the foot at the bottom of the tail and head feathers are something else entirely. Similarly, while the twisting of the entire figure as though it is turning away from the viewer seems in keeping with the distortion of figures to fit a particular shape in classic works, Reid handles the distortion with high imagination, inverting shapes on one wing on the other, and presenting some shapes in full on one wing, but only hinting at them in another. It is as though Reid is inventing a new form of perspective that comes from neither Northwest nor modern art, although obviously drawing on both. Reid’s design is equally playful when it comes to symmetry, seeming to abandon it at first glance, but really playing some complex games with it. The body of the raven is defined by the triangle formed by the ovoids on the wings and at the base of the tail, an unusual shape in traditional art. At first, too, the body seems asymmetrical, with the left wing showing three flight feathers and the right wing four – but then you notice that the right wing’s four feathers matches the four toes on the foot and the neck feathers, and forms another triangle whose angles are an inversion of the first triangle. Then, in contrast to this complexity, there’s the simplicity of the head, with its economical lines and the heavy beak that suggests both the classic depictions of the raven and their actual appearance. It’s a complex work, and one that could only come after decades of development, with clean lines that stand out all the more because the design is black on white. I don’t know if I got a bargain or overpaid, or whether the purchase will prove a good investment. The price was acceptable to me, and, since I bought the work because I admired it, I don’t care if its value increases over time. But the work shows all the mastery of Reid’s last period, and I admire it hugely. The only trouble is, I’ve hung it in our hallway, and the rest of the hallway cries out for a matching banner. So, I suspect this won’t be the only Reid banner I’ll be buying this year. But if I can get one that intrigues me as much as this one, I’ll be extremely well satisfied. Books about management techniques rarely mention how to lead computer programmers. The few that do sooner or later reach for a cliché and compare the effort to herding cats — J. Hank Rainwater, for instance, uses the phrase as his title. Partly, the comparison reflects how much the topic is outside the corporate mainstream. However, the comparison also reflects the conflicting nature of the job. The typical IT department represents a separate culture within a company, and a successful manager must both understand that culture and stand between it and the rest of the company, trying to explain each to the other. I’ve seen dozens of managers — including me — approach this conflict, each with varying degrees of success. My observations here summarize what I believe are the basic facts that managers needs to know to manage programmers. They apply to any programmers, but especially those involved in free and open source software (FOSS), many of whom develop typical programmer attitudes to an extreme. Although some of the points seem obvious to those familiar with programmers, let me assure you: To outsiders, if their mistakes are any indication, the points still need to be emphasized. You’re in a meritocracy. Prove yourself. Management gurus usually focus on the characteristics of natural leaders and how you can imitate them. They give ambitious managers heroic images of themselves as samurai warriors, Antarctic explorers, or Henry V. However, neither the discussion nor the image is much use when you manage geeks, because developers, regardless of whether they are involved with FOSS or not, are more concerned with results than any real or artificially generated charisma. Before you can even start to lead a group of geeks effectively, you have to prove yourself to them — either by showing your competence in their area of expertise or by demonstrating that you have useful expertise that they lack. To become truly effective, you need to go further and prove that your expertise helps the group and everyone in it towards their goals, and that you have at least a high-level understanding of what everyone else is doing. Until you prove yourself, you can expect to be tested, even if you’re a former programmer yourself. The probing can be aggravating, but the good news is that, if you prove yourself, you can quickly become accepted. At one company where I worked, the CTO had an impressive programming background, but it was some years in his past. The developers questioned his decisions constantly, right up to the time that he started delivering tough but accurate critiques of their code. The questioning stopped overnight. Watch how people spend their free time with family and friends, and you’ll soon notice a preference for informal structures. Given anything resembling a choice, people choose not to be in formal hierarchies, especially if they’re near the bottom of it. A hierarchy may be efficient, but, by being its local representative, you automatically become the focus of resentment. This natural anarchism is stronger in developers than in most people. If you think for a moment, a meritocracy implies a constant shifting of status that depends on who has done what recently. Add this political instability to a widespread feeling of being different and misunderstood, and the resentment of leaders becomes stronger still. Moreover, in FOSS, where status is still one of the main coins with which programmers are paid for their efforts, these attitudes may be taken to a further extreme. Neither being in a position of authority nor being older — as managers often are — is going to command automatic respect in the IT department. You might assume that your position reflects some superior qualities such as intelligence or ambition, but the development team probably doesn’t. Management consultant Tim Bryce insists that most programmers are no smarter than anyone else in a company, but that’s not what they believe. Rather than relying on any natural or structural authority, IT managers need to see themselves as coordinators or problem solvers, working within the culture of their department whenever possible rather than against it. Nobody has ever shown the causality, but there’s probably a connection between the fact the era in which the corporate hierarchy has flattened corresponds to the rise of the IT industry. Because of the economic important of the computer industry, its values are spreading through the rest of the business world. emphasize that one management style doesn’t fit everybody. However, many gurus and the managers who listen to them continue to assume that what motivates them — promotion, money, perks — also motivates programmers. For those unfamiliar with programmers’ culture, the process of realizing they are wrong can be disconcerting. “Leading programmers is different from leading most employees,” career expert Tag Goulet says. “At one of my previous jobs at a startup, I was the vice-president of production, and led a team of three programmers. One of the guys posted Dilbert cartoons by his desk that poked fun at Dilbert’s pointy-haired boss and were quite possibly references to me. I’d never seen cartoons like that in more corporate workplaces. Instead, everyone was always careful to have political decor that implied that they were all team players.” In fact, such cartoons, like the popular Demotivator posters that satirize inspirational corporate art, are often the first indicators that many programmers are skeptical, even dismissive of the values that many managers take for granted. The trouble is, managers usually have backgrounds in business or marketing, and are outgoing people who prefer to work with others. By contrast, most programmers are the academics of the business world, inwardly focused and preferring to work with inanimate objects. If they’re FOSS-oriented, they may also have a strong streak of anti-corporate sentiment. While they won’t turn down money, for them job satisfaction is more likely to lie in greater challenges or responsibilities, and, especially for those involved in FOSS, credit for their efforts. Impromptu bowling in the hall may motivate your sales force and marketers, but, chances are that programmers will only feel like they’re being spirited away into a nightmare of frivolity. A weekly pizza night or an evening at a night club to celebrate the successful completion of a project might be satisfying to a human resources team, but your programmers will either resist being dragged away from their projects or, if they’ve just come off a coding spree, resent losing time they could spend with their families. Instead of being events to anticipate, such efforts are more apt to be seen as annoying obligations. Instead of trying to make such by-the-book motivators work for programmers, think about you can implement the intrinsic awards that actually mean something to them. Reward those who meet their deadlines with greater autonomy in a project, or by giving them the chance to become project leaders or to telecommute so long as they meet their responsibilities. Let FOSS participants have time to work on free projects once they’ve met their deadlines; even if the projects have no immediate use to the company, they may become useful later, and, meanwhile, your sponsorship gives the company a good reputation among potential future employees. Credit is the most important motivators, especially for FOSS participants, but don’t forget the cultural differences. Most developers are only going to be embarrassed by being singled out for praise or an employee-of-the-month award at a meeting. Instead, let people know that you’ve noticed their efforts and given them credit elsewhere in the company. Shortly after I became a product manager, I discovered a major bug in a commercial product that was just at the plant and ready to be assembled. Put in charge of disaster recovery, I asked the team to assemble every hour so I could report to the company officers on the state of their efforts. After the disaster had passed, I found that I had left resentment in my wake. Not only did the programmers dislike meetings, but, by keeping such a close eye on events, I was questioning their competence and taking responsibility away from them. The emergency was real, but I was hampering their efforts to resolve it, not helping. This kind of situation can’t always be avoided, but experienced managers will give all members of a programming teams as much autonomy as they have proven themselves capable of using responsibly. Partly, that means mediating between programmers and the demands of executives, but it also means only making an appearance among the cubicles when absolutely necessary. Instead of calling everyone together, I would have done better to send email requests or appoint a programmer to provide status checks. Better yet, I could have asked the team for a firm deadline and not interrupted anyone until that deadline while explaining to the company officers that the solution was being worked on — which was all they wanted to know anyway. For managers, meetings are times when work gets done. For programmers, however, attending a meeting usually means time away from their work. Sometimes, especially at the start of a project or at a crisis, a meeting is unavoidable, but managers need to accept that programmers are likely to resent meetings and become more impatient with every minute that passes in the board room. The fewer and shorter the meetings, the more easily the developers will accept them. Every couple of years, programmers become excited by a new programming language such as Java, .NET and Mono, or Ruby. Inevitably, whenever a project begins, some of your team will argue strenuously that it needs to be done in the latest fashionable language. Sometimes, this argument may be justified, but it is more likely to represent intellectual curiosity than sound design practice. Almost always, the argument is a recipe for chaos. At one company where I worked, so many different languages were represented in its product suite that individual modules only communicated with difficulty. Several attempts to rewrite the suite in a single language only added to the complexity because they were never completed, and legacy support remained an issue. This trap is easier to avoid if you have a programming background yourself, but any manager should be wary of adding another language to the stack. Not being interested in business, many developers tend to ignore necessities like deadlines. Many become skilled at dodging them. The problem isn’t that most developers can’t be trusted to work responsibly by themselves, so much as the fact that they can be almost guaranteed to tinker as much as the schedule allows. In such cases, for all that successful management of geeks means understanding their culture, it also means recognizing when moving to achieve corporate goals are more important. At times, understanding needs to take second place to necessity, even at the cost of resentment. Skilled managers minimize conflicts with their staff, but they also recognize that some conflicts are unavoidable. Managing programmers — especially FOSS ones — is an extreme version of the balancing act that any manager must do. On the one hand, managers need to understand the culture of their departments and how to work within them. On the other hand, they also need to act as intermediaries between that culture and the rest of the company. Combining these goals means adjusting your concept of management to the department. Sometimes, it means interpreting programmers to non-programmers,or shielding programmers from the misunderstanding of executives in order to achieve corporate goals. At other times, it means awakening programmers to the larger goals of the company. It’s a precarious balance, but knowing what to expect as you go into the position can leave you with more time to handle the challenges that arise without being distracted by cleaning up your mistakes or a lack of cooperation from your team.